The sanctuary of First Christian Church, Downers Grove, IL, proudly proclaims the congregation's welcome to all! In just a couple of weeks, I will perform a wedding. It’s going to be a grand celebration. Plans have been in the works for months. The decorations will be perfect, the party to follow full of laughs, great food, and hilarious stories, and if I can keep all tradition, of my notes together, the ceremony will reflect just how sacred the ties that bind two people in love are. Moreover, in New York, where we’ll be celebrating, the wedding will be legally sanctioned. That is not the case in the state where this couple lives. I met them when I was an associate pastor at their church several years ago. They’re great guys—one was one of the first congregants to volunteer to help me move into a new apartment when I moved to town, the other—a nurse by vocation—was part of a small ad-hoc medical team that went with me on a mission trip to El Salvador a year or so into my time serving in the congregation. One is the ultimate extrovert; the other a bit on the shy side. Like each of us, they are unique, but they aren’t terribly different from Midwesterners and transplants who have similar stories of meeting, going on first dates, and deciding that—yes—this person is the one I want to tie the knot with. Rings will be exchanged, cake will be cut, a license will be signed, and God will smile. I just know it. I can’t wait to share that day with them. Growing up, youth group was a big part of life for my oldest stepson’s partner. He forged important friendships, developed a deep sense of Christian spirituality, and had a place where he belonged. Until he came out of the closet. He tells stories that will break your heart. Of friends who turned their backs on him as soon as he told them he was gay. Of rejection at the hands of a community that nurtured him. Of his fear to be honest about who he is. But he will also tell you about how he looks forward to the day when he will be able to marry my stepson (not legal where they live either! ), and how my wife made him feel welcome on the first day my stepson introduced them. And he will tell you about how he can’t wait to start a family of his own. I tell these stories because I think they help highlight an important dynamic that often gets lost in the debate over the inclusion of LGBTQ folks in the life of the church. Far too often, the debate evokes an image of LGBTQ folks as some sort of alien force, a totally estranged (and strange) group banging on the outside walls of “our” well-groomed, well-ordered churches. It’s easy to mythologize outsiders as a threat—especially when buoyed by Biblical interpretation that disregards historical context or the insight of cultural studies, outdated pseudoscience, and prejudice disguised as piety. But I am reminded—by the lives of my friends preparing to marry and by the life of my stepson’s partner—that for churches, to reject the full participation of LGBTQ folks in the life of the church is to reject people already in our midst, their families, their gifts, and their callings as people of faith. 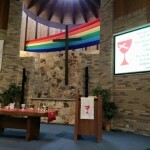 When we, as Disciples, reject people in this way, we fail to not only live into our call to be people who proclaim that we experience God at a table open to all, but we fail to recognize the work that God has already done among us through the lives of gay, lesbian, bisexual, transgendered, and queer men and women participating (sometimes silently) in our churches. We are not only rejecting people, but we are rejecting the experience of incarnation—that God becomes flesh through the life of Christ, and that the body of Christ remains present—resurrected– in the world through the work of each of us who makes up the church. Or, as the author of Matthew might say, to deny our brothers and sisters is to deny Christ himself. My friends and my stepson are hardly the first people to have stories like these. You likely know folks with similar experiences. Altogether, they remind me of one thing I know for sure: when it comes to the debate over the lives of LGBTQ folks in the life of the church, the people making the wrong choice are not those who are being honest about their sexual orientation, but those who are choosing to forget how to pass along the generosity God offers to us all.